Rainy fall weather means I can pull out my stock pot and cook up giant batches of soups and stews without looking like a crazy person who would happily eat a bowl of piping hot whatever all year-round, no matter the temperature. Creamy and rich Lobster bisque on a sweltering 90 degree day? Spicy hot curry in the middle of July? Yes, please. I’ve mentioned before that love might be a mild way to describe my relationship with soup; not only is it a giant bowl of comfort, but it’s also the perfect, easy one-dish meal — something I’ve come to rely on as a mom. So now that fall is here, I get to leave my favorite vegetarian soup cookbook out on the counter without worrying what my seasonally-minded chef husband thinks, and I couldn’t be happier. I’ve been meaning to share this recipe for a longtime. It’s a favorite in our family and one I make quite often, which says a lot since it’s a recipe for chili. If there’s anything I’ve learned about cooking, it’s that there are certain foods that just can’t be messed with: foods that we like the way we like them, usually as a result of how our mom cooked them, or that we have associated with certain flavor profiles and taste memories that are particular only to us. Chili is like that for a lot of people. Most comfort foods are. But we don’t just get picky about how chili is cooked (meat or no meat — and what kind of meat — one kind of bean or more, extra veggies or just lots of tomato and onion…the list goes on), no, we also get very particular about how it is topped. Saltines or cornbread? Shredded cheese or sour cream (or both)? Chopped raw onions or jalapenos to give it an extra kick? Everyone has an opinion about chili, which is why it is somewhat miraculous for me to have found a recipe that tempts not just my meat-loving Texan husband and spice-adverse three year old, but also the vegetarian no-love-lost-for-chili me. Honestly, I grew up hating chili. In my house, it was always loaded down with beef and not much else beyond tomatoes, onions, and whatever seasonings mid-westerners think say “southwest.” I had to smother it in cheddar cheese and crunched up saltines in order to just barely gag down the bowl set before me. It wasn’t my mother’s cooking; it was the fact that a big bowl of meat soup does nothing for me (to say the least). For a long time, I thought I could never enjoy, let alone desire, chili. But slowly I started to come around with Chris’ occasional vegetarian versions, and when I finally discovered this recipe, I realized the magic that can be found in a bowl of chili. It’s a little bit spicy (or a lot if that’s your thing) and a little bit sweet, studded with colorful vegetables, and even better the next day spread across sliced baked sweet potato and topped with sour cream. It’s a vegetarian version of chili that will also appease any meat-lover, and it’s the perfect dish for a busy parent to cook since it only gets better sitting in the fridge waiting for tomorrow’s dinner, where it will feel like a completely different meal. 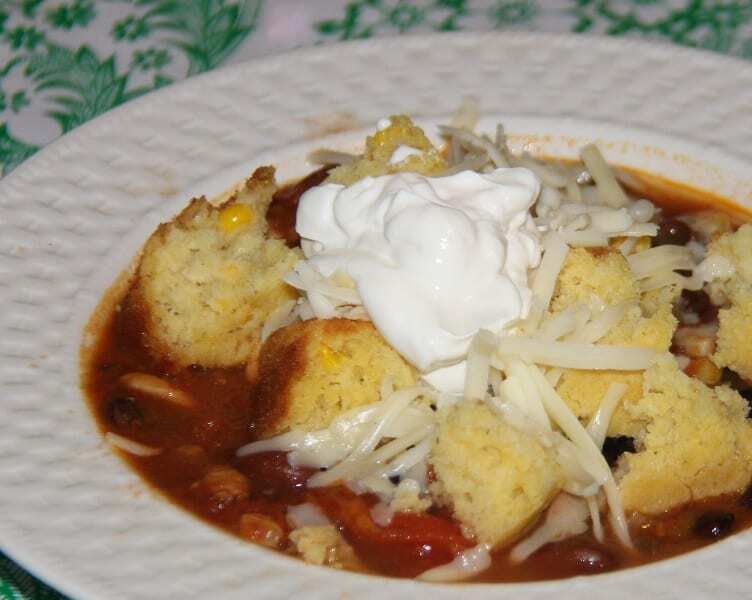 I love it and I hope you will too, since this recipe, just slightly adapted from A Beautiful Bowl of Soup, is what made me a chili convert. Heat the oil in a large stock pot or Dutch oven over medium heat. Add the onion, bell pepper, celery, and garlic; cook, stirring occasionally, until the vegetables are crisp-tender, about 8 minutes. Stir in the tomatoes with juice, tomato puree, beans, water, corn, chili powder, Tabasco (if using), cumin, oregano, bay leaf, and pepper. Increase heat to high and bring to a boil. Reduce heat; cover and simmer, stirring occasionally, for 15 minutes. Stir in cashews and raisins; continue to simmer, covered, until the raisins are plump and the cashews are tender, about 20 minutes. During the last 5 minutes, stir in fresh basil. Remove bay leaf. Taste and adjust the seasoning (salt to taste). Makes 8 cups, 6-8 servings. Immediately after making, serve in bowls with desired garnishes. On second day, chili will have thickened considerably; reheat and serve over sweet potato slices garnished with cheese and sour cream, or thin with vegetable stock to desired consistency for soup. Keeps up to 5 days in the refrigerator and also freezes very well.